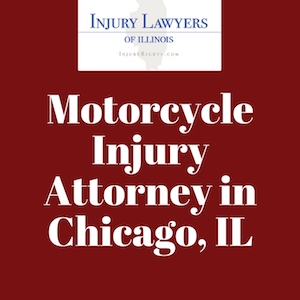 Injured in a motorcycle accident in Chicago, IL? Chances are the accident wasn’t your fault and that we can help. Most people have an opinion of motorcyclists as leather-clad bikers who veer in and out of traffic or travel at high rates of speed and expect to see such risky behavior from drivers they may see as questionable. In truth, however, in the case of a motorcycle incident between a motorcycle and another vehicle, it is the drivers of cars or trucks who are more likely to be at fault. Motorcycle riders are at a much higher risk of injury, given their size compared to that of even a small car. Many motorcycle riders suffer catastrophic injuries including fractures, brain bleeds, and even worse, death. There are certain situations where crashes are more likely, and being aware can keep motorcyclists safer. We’ve compiled some of the most common reasons why motorcycle accidents occur, giving riders insight into what other drivers might be about to do that could put their life at risk. Head-on collisions. More than half of all motorcycle deaths are the result of head-on collisions. Cars making left-hand turns. According to statistics, 42 percent of all accidents between motorcycles and cars occur when cars turning left hit a motorcycle going through an intersection from the other direction or hit a motorcycle that is attempting to pass it. In almost all cases, the driver making the left-hand turn is at fault. It is the most common cause of motorcycle accidents, so motorcycle drivers need to be aware and prepared at every intersection. Motorcycle lane splitting. When a motorcycle drives between two lanes of stopped or slow-moving cars (most often to avoid a traffic jam), the risk of an accident is elevated because the motorcycle has less space in which to maneuver, and drivers often don’t notice a motorcycle when they attempt to maneuver. Lane splitting is not legal in Illinois, although it is permitted in some other states. A car changes lanes without seeing the motorcycle. Drivers often have blind spots, and motorcycles are sized to fit virtually all of them. A car hits a motorcycle from behind. According to statistics, the most common car accident is what is known as a fender-bender, and it occurs when a car fails to stop before hitting the vehicle in front of them. An incident that would mean simple car repairs between two vehicles can become catastrophic if one of those vehicles is a motorcycle. It is risky riding a motorcycle, especially in the windy city of Chicago where lots of traffic and distractions cause accidents. Based on estimates from the federal government in 2010, motorcycle deaths are 30 times more likely than vehicle deaths based on miles traveled. Head injuries are most commonly associated with motorcycle accidents, but about 37 percent of motorcycle deaths and 67 percent of brain injuries could be prevented by wearing a helmet. That year, 4,300 motorcyclists nationwide died in crashes. In order to not be part of that sobering number, motorcyclists must be proactive about their own safety, doing what they can to stay safe on the road, no matter who else is sharing it. Don’t drink and drive. Drinking dulls your senses and your reaction time, making it more likely that you’ll have an accident. Wear a helmet. According to statistics, a quarter of young motorcycle drivers who were fatally injured in crashes were not wearing helmets. Illinois does not have a helmet law. The National Highway Traffic and Safety Association reports that helmets saved an estimated 1,630 motorcyclists in 2013. Dress appropriately. Leather can provide big protection in an accident, preventing road rash and providing some element of cushioning if knees, elbows or other body parts come into contact with the road. Wear shatterproof goggles. While your bike’s windshield may protect from small debris, preventing it from being a distraction, there are still plenty of things on the road that can do serious eye damage. Wearing goggles can prevent both an eye injury or an accident that occurs as a result of an injury. Be visible. Being seen can be your best defense. Whenever your bike is on the road, make sure your headlights are also on. Wear reflective clothing or reflective strips so you are more likely to be seen, even on cloudy, foggy days. Stay in your own lane. Motorcycles are more visible in a separate lane, so if you’re riding on a two-lane highway, pick the opposite lane and stay back to prevent being in a blind spot. Staying back will also ensure that you won’t be taken by surprise if the other driver decides to shift lanes. Still, despite any safety precautions you may take, you are still at risk of an accident & injury since other drivers are usually at fault. In Illinois, more than 3,000 motorcycle accidents resulting in injury occur each year. Most of them are in urban areas such as Chicago, where traffic travels at a high rate of speed, putting more vulnerable riders at a higher risk of injury, and cars may not see a smaller motorcycle. If you have been involved in a motorcycle accident, it’s likely you have injuries. If your motorcycle accident was someone else’s fault, having the right attorney can help you get the compensation you will need to cover medical expenses to cover those injuries, as well as lost wages and pain and suffering. If you were injured in a motorcycle, call our firm today. Your first consultation is free, and you pay nothing until we win your case.